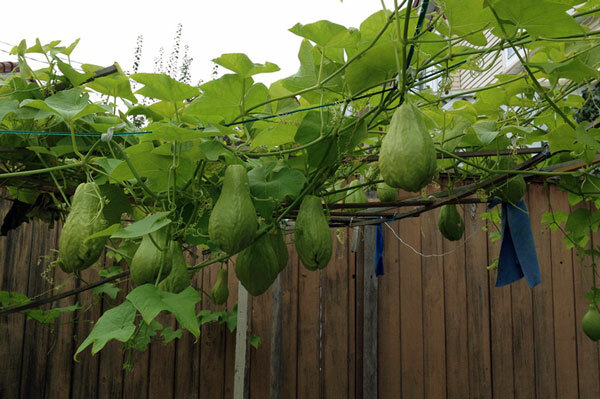 Chayote squash flourishing in a Vancouver garden. Photo by Lilli Wong. Used with permission. In small backyards, informally shared plots and community gardens, Vancouver gardeners know how to make the most of small growing spaces. We also take full advantage of having a milder climate and longer growing season than almost any other Canadian city. These particularities of urban form and climate inspire many Vancouver gardeners to pursue the art of growing chayote squash, or Buddha hand melon. Photo by Jean Pierre Cote of chayote harvested from his Vancouver garden. Used with permission. If you garden in Vancouver and aren’t yet familiar with chayote (also known as Buddha hand melon, christophine, mirliton, cho cho or vegetable pear), you are in for a treat. Native to the tropics, this prickly squash is grown around the world wherever the climate allows. It grows quite well in Vancouver with a little help to mitigate cooler temperatures, such as starting seedlings indoors in the spring. The easiest way to get started growing chayote is to buy potted seedlings, available at Chinatown produce markets in April or May. Alternatively, you can save entire squash (not just seeds) from the fall harvest. Sprouting from seed allows you to select for desirable characteristics such as bigger fruit or smoother skin. Simply wrap the squash in newspaper and store them somewhere dark and dry until they sprout in February, when you can pot them indoors. A christophine plantation in Trinidad shows chayote thriving in its native tropical climate. Photo by Lyndsey Baillie. Used with permission. However you obtain chayote seedlings, plant them outdoors in May around the same time you would plant tomatoes. Water well, stake the vines, and provide with plenty of trellis. Some gardeners cover their plants with plastic in cold weather. By late autumn, most Vancouver gardens are ready for winter but an early November walk through my neighbourhood of Cedar Cottage revealed ripe chayote still hanging from trellises on almost every block. As with zucchini and other types of squash, overabundance is an occupational hazard of chayote gardening. Each vine can grow to be 10 metres long and can produce anywhere from a dozen to a hundred fruit. 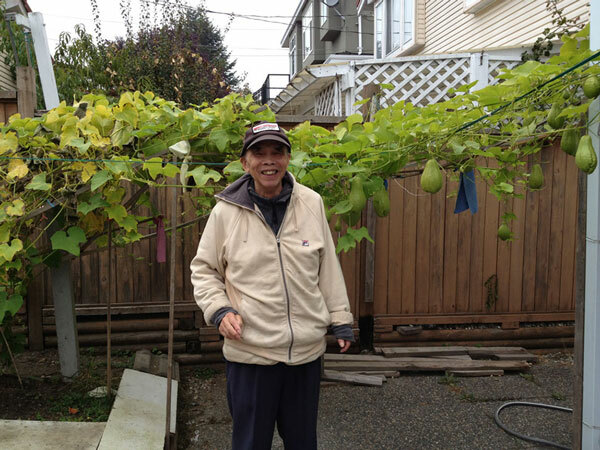 Vancouver gardener Raymond L. shows off his chayote crop. Raymond selects the smoothest fruit each fall to save for spring planting. Photo by Lilli Wong. Used with permission. Fortunately, friends and neighbours are happy to receive extra squash. With a light flavour often compared to cucumbers and a filling texture more like potatoes, this versatile fruit has earned its place in Mexican, Chinese, Vietnamese, Cajun and many other cuisines. Jean-Pierre Cote, a local food artisan, suggests baking chayote with cheese, as in this recipe. My neighbour Lilli Wong recommends stir-frying it with garlic, ginger and pork, or adding it to soup. Another neighbour, Laura, suggests preparing a Mexican dish like the ones in this video. If you have a chayote gardening tip or favourite recipe, please share it in the comments! 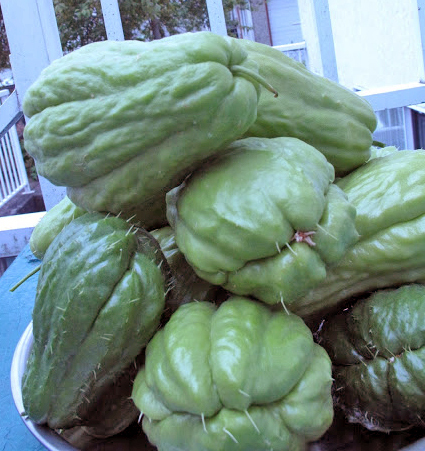 A big thank you to my wonderful neighbours who connected me with gardeners and answered questions about chayote for this post! Special thanks to Laura B., Jean Pierre Cote, Leo, and Raymond L for sharing their gardening secrets and recipe ideas, and to Lilli Wong, Lyndsey Baillie and Jean Pierre Cote for the fantastic photos. Vanessa Kay is a Vancouver-based policy analyst and a fan of the many little communities that make great cities tick. When not creating scintillating infographics, she enjoys blogging and going undercover as a folk musician.